Every year, the Travel+Leisure World’s Best Awards survey asks travelers to weigh in on their favorite hotels—from the location and facilities down to the service and food. And while New York is home to almost every big hotel brand in the world, The Palace was named a reader-favorite and one of the city’s best. Thank you to all the guests who took the time to weigh in on why The Palace is so special, and for those who have yet to visit, here are our top 10 reasons to plan your trip today. Visitors in New York want to say in the heart of Manhattan. At The Palace, you’re just steps away from the best that New York City has to offer: world-class dining at Rockefeller Center, iconic works of art at The Museum of Modern Art, and famous Broadway theaters. 2. It’s a tranquil refuge in Midtown. We may be located in the thick of it all, but stepping through the gates of The Palace is a respite from the hustle and bustle. 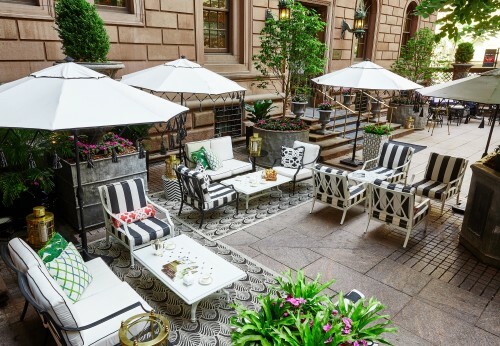 Our hotel is located in the landmark 1882 Villard Mansion, complete with a peaceful courtyard and dramatic entryway to the hotel’s grand lobby. Rising above the historic Villard mansion is a modern tower with 909 rooms and suites, including 176 spacious suites in The Towers at The Palace. Here you can stretch out, relax, and get all the personal space you need after a day of exploring Manhattan. 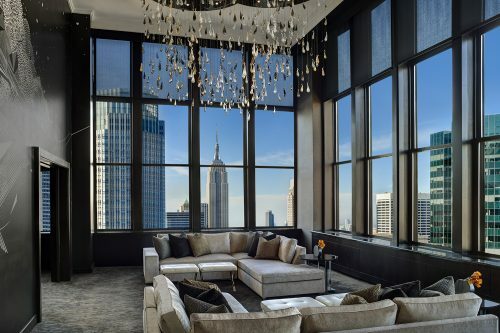 Be the envy of every New York native with one of the most stunning views of the city. Our 55-story hotel provides some of the best skyline views from within the heart of Manhattan. 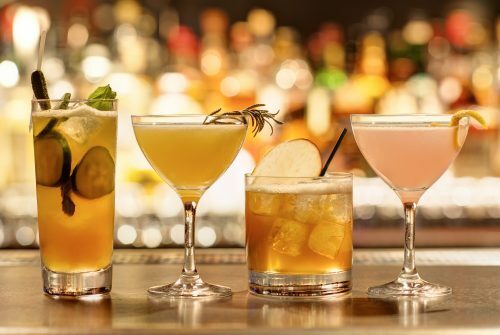 At Trouble’s Trust, order some of the finest cocktails with New York spirits or hand-crafted ales and crisp lagers from Brooklyn and the surrounding area. 6. The Courtyard (and more cocktails). The Courtyard at The Palace is the best spot for an Aperol Spritz in the evening. For a refreshing retreat, join us for our specialty cocktail menu and live music in Manhattan. 7. Brunch by Chef Oscar Granados. 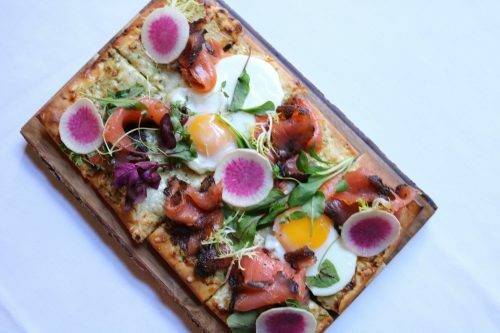 At VILLARD Restaurant, a full a la carte breakfast and weekend brunch menu features exceptional New American care crafted by Chef Oscar Granados. 8.The spa at The Palace. A range of signature treatments and luxury spa packages are on offer at the spa at The Place. Every experience is customizable, whether it’s a quick massage or an entire day of relaxation. 9. A chance to make the most of a business trip. A premier business hotel in Midtown, The Palace offers more than 24,000-square-feet of meeting space and plenty of business-friendly services. Host a successful meeting, then take a break with world-class cocktails and dining at The Palace or nearby in Midtown. 10. And finally, indulge in a guilty pleasure. From Law and Order to Will and Grace and 27 Dresses to Gossip Girl, plenty of binge-worthy TV shows and movies have been filmed at The Palace. Walk in the footsteps of famous actors, or slip into the lives of one of your favorite fictional characters. Book your stay on The Palace website to get the guaranteed lowest rate on your next trip to New York City.